Tuesday June 6th 1893 We finished the ironing and did a little more on the rags. In the afternoon Hattie came over with the horse and she and Fanny went to their society meeting. I went over home and took Mother over to Mary Woolfs. When I came home and found Fanny at home sick, She felt better by evening. we wanted to go to hear Mary Anderson graduate but could not. I had quite a time settling with Mr Hatfield. Wednesday June 7th 1893 The boys went away this forenoon and Josie and I cleaned up their room real good. In the afternoon Fanny and I worked at the rags and finished them up at five oclock. Hattie and Edith were here. I went down to see Mrs Stump after supper. 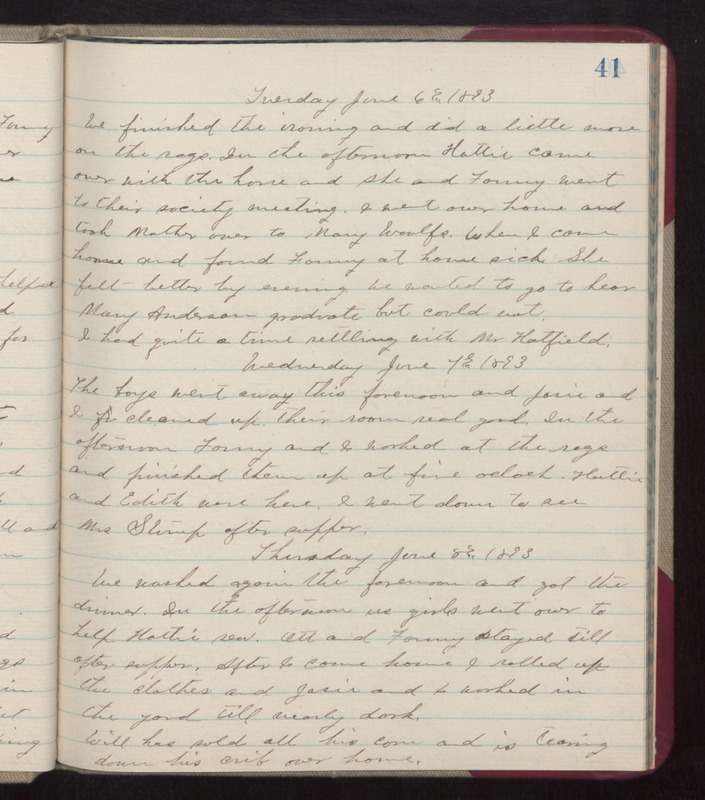 Thursday June 8th 1893 We washed again the forenoon and got the dinner. In the afternoon us girls went over to help Hattie sew. Ott and Fanny stayed till after supper. After I came home I rolled up the clothes and Josie and I worked in the yard till nearly dark. Will has sold all his corn and is tearing down his crib over home.